Staircases have long ago stopped to be just a necessary construction for movement on different levels of premises. 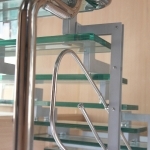 Nowadays they are an integral part of an interior requiring not less attention. 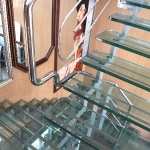 Staircases with glass steps are very often used in a modern design. Their lightness and airiness give a special feeling of a spatial freedom. 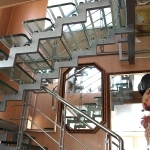 Steps for such staircases are produced from triplex. 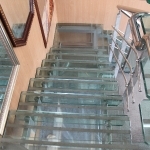 Their number directly depends on a width of a staircase and guarantee safety in case of load and impact. 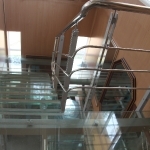 The width of a glass step should be not less than 20-30 mm. 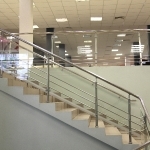 Point fastener system with use of spiders provided with hinge joints are most often used for assembly of glass staircases. It allows to compensate dynamic loads, as steps due to its prolate form are especially subject to deformation. 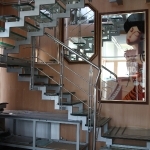 Bearing structure of staircases is made from stainless steel. • inserts made from rubber or other nonslip materials.